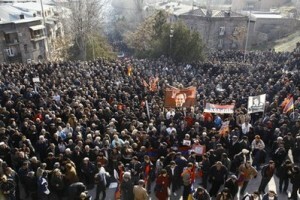 More than 10,000 antigovernment protesters rallied in the capital, Yerevan, on Thursday, demanding new elections and the release of their incarcerated colleagues. Their leader, former President Levon Ter-Petrosian said the protest movement had been inspired by the revolts in the Arab world, and promised that any change in government would be peaceful. The demonstrations began in February, on the third anniversary of the violent suppression of a protest after a disputed presidential election in 2008.